This ZK series automatic laminating machine (paperboard laminator) is mainly used for laminate paperboard with board or A flute, B flute, E flute, F flute and 5-layer cardboard. 1. There is teeth rod to adjust the width of sheet, leading to easy adjustment and timesaving. 2. The imported synchro-belt is adopted with the driving system, making it running steadily and suitable in high speed. 3. 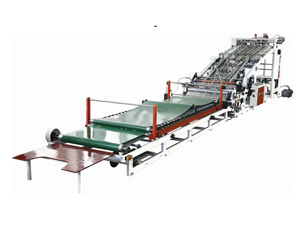 For the PVC material made conveying belt, with the feature of long life span and good quality. 4. Regarding the sheet-pushing chain, it is adopted with imported double-row type, which is running steadily and not easy to distort. 5. The laminating machine (paperboard laminator) adopts timing control with frequency conversion, with the feature of power-saving and automatic timing. Founded in 2009, Shanghai Pripack Machinery Co., Ltd. has continually focused on providing a wide variety of paper bag making machine, hot foil stamping machine, flexographic printer, printing machine for customers around the world. We are very familiar with international market of case maker, laminating machine, flexographic printer, paper processing, printing and packaging and its trend of development. With high quality assurance, our products are popular in markets including Ukraine, Russia period, Chile, Brazil, Argentina, Mexico, Malawi, Pakistan, South Africa, to name a few. With products of high quality assurance and CE certificated, we are sure to provide our customers with the best products at competitive price.